What is the difference between earthenware and porcelain? English porcelain is simply the highest quality ceramic clay available. We use it exclusively in our products because the pottery you purchase for your church must last for many years. Porcelain is fired to a much higher temperature than earthenware, and is much more durable and resistant to chipping, cracking or breakage. 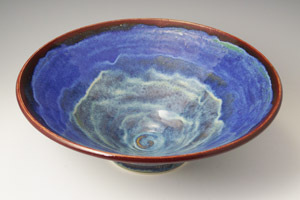 Don't be misled by earthenware that has been coated with a porcelain slip. It may look white, but it is not porcelain. Earthenware is a low-fired clay, the same material used to make ordinary flower pots. It is easily chipped and broken, and won't likely withstand normal handling and washing over time. We ask that you allow up to 12 weeks for your order to ship; however, Hue will consider rush orders. We are currently building our inventory of completed pieces, so we may have the pieces you order in stock for immediate shipping. If so, we'll let you know your pottery is on its way. 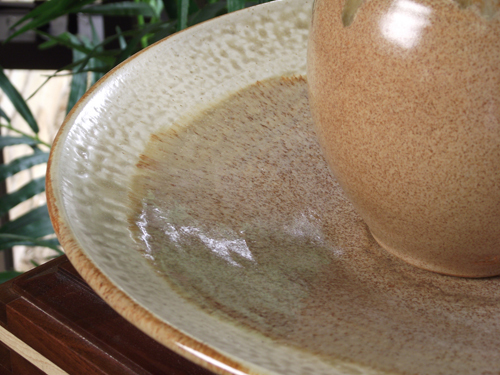 Faith Vessels welcomes making custom pieces within the parameters of Hue's creative style, glaze colors and materials. If you would like a piece that is not pictured on our website, please contact us to discuss how we may create a special piece for your church or home. The answer depends on the size and complexity of the order, and whether it requires Hue to develop new forms or to make items that are not in his usual line. Each piece is individually created, so it is not uncommon for Hue to make 2-3 preliminary versions before finalizing a new design. Please be assured that your order will be placed on the schedule as soon as it is received, and we’ll keep you informed of our progress toward completing your order. Custom orders may take up to 12 weeks; however, in some cases will ship earlier. How do you handle payment? Is there a deposit or other advance payment required? When you order on our website, you'll need to pay in full. As an option, you may pay 50 percent down when you order, with the balance due prior to shipping. If you have any questions concerning the deposit or payment, please contact Marla at 417-864-7874. What forms of payment does Faith Vessels accept? What if my order isn't quite what I expected? We want you to be absolutely satisfied with your purchase. We will email images and dimensions of each piece for your review and approval prior to shipment. Should you receive your order and decide to return or exchange your pieces, we will accept returns as long as all items are returned in resalable condition within 30 days of purchase. You will be responsible for all shipping and insurance costs. For those items that are made to your specifications, personalized, or otherwise not appropriate for resale to others, we are unable to make a refund. If you have any questions that aren't addressed above, please contact us!